Two very Interesting days touring Ushuaia. Great mtns all around. Went to historic ranch on Beagle channel and to national park. Some rain. Snow two of three days. Will come again. Now on our luxury ship Corinthian II. We sail into Beagle channel then south soon. Very little posting expected. Today we flew to the south tip of So America to Ushuaia. Like SE Alaska. Rainey. Steep streets and lack of la d to build on. The ship we were to go on was damaged so Travel Dynamics added two days at their expense - room, meals and tours. Today fles and just walked the town. Different, but lots of tourist shops. A tour tomorrow. Another Sat. Then on the ship. It's not easy to type and to correct on the IPhone. A great city. 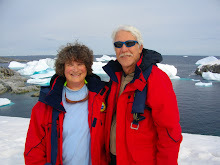 We - four of our family - Are here on our way to Antarctica. Three days now and one at the end. We are in a luxury hotel near many of the top sites. Many cafes have free wifi but not this hotel. I am using At&t data roaming on my iPhone. Hasta ...My Spanish is very weak. Hey... They use different words than the Latin Am Spanish Rosetta Stone teaches - gaseosas vs refresco for soda pop. Update. I bought hand-made leather shoes for $35. We had dinner for four with six kinds of meat with wine, grilled veggies, salad and aperitif for $100 including service. OTOH In our hotel anything but dinner is very expensive. Following the sudden death of my Mac in the Pacific Ocean, I set off Monday morning for a quick post mortem, knowing it would end with a purchase. I was going to buy another MacBook. After two years they are a little more capable - especially the track pad - and a bit cheaper for more memory. My external backup hard drive uses the firewire interface and - surprise - the MacBook is less capable there; no longer offered. So - throw me into the briar patch - I had to buy a MacBook Pro. It's very nice and only $200 more. It's aluminum instead of plastic, like my PowerBook G4 of the past, has backlit keyboard, firewire 800, and probably better graphics processor. The display looks great. Sweet. But firewire 800 has a big disadvantage versus 400. FW 400 uses a sturdy connector with a metal sheaf that clicks firmly in. FW 800 has a cheap plastic connector that comes out easily. Data can be lost if the hard drive becomes disconnected. Bad design decision. I am frantically restoring my data from the Time Machine backup. It's strange because I have two administrator accounts that block each other from accessing their files. I am making slow progress. There must be a better way. I am even reading about the whole area of accounts and file permissions. Desperate, eh? Posting while in Cabo stopped suddenly. I had plenty of time and had found free internet for the price of a cup of espresso Americano. But my Mac tried to swim in the Pacific Ocean. Dead. Monday I am off to buy another. Two weeks of tropical sun was pretty nice. By the end I had enough of "sun by the pool." Actually I have never done that during our more than 20 trips to the tropics, except for the few trips I had to watch kids in the pool. I like long walks on a firm beach and I watch for whales while sitting in the shade. I will just have to adjust my activities. Learning Spanish did make it more interesting. I even used just a couple of words or a short phrase here and there - even our room number - in Spanish to keep up my practice. The health care revolution will not be televised despite what President Obama promised you two years ago. We are supposed to understand that campaign promises are temporary - just to fool us to vote for him. But then Nancy Pelosi takes over. Obama has broken his campaign promises to make the health care debate a transparent process after saying he would do so on at least eight ocassions during his 2008 White House run. Instead, Obama prodded House and Senate Democrats to get him a final health care bill as soon as possible -- encouraging them on Tuesday night to go behind closed doors and skip the usual public negotiations between the two chambers in the interest of speed. During the 2008 presidential campaign, Obama repeatedly told voters that the health care overhaul would take place in a public forum, most notably on C-SPAN, conservative bloggers pointed out today. In a video montage posted on Breitbart.tv, Obama is seen promising voters -- on eight different occasions -- that the health care debate would be transparent. For example, during a meeting with the editorial board of The San Francisco Chronicle on Jan. 20, 2008, Obama said, "These neogtiations will be on C-SPAN, and so the public will be part of the conversation and will see the choices that are being made." In another clip, dated Nov. 14, 2008, Obama told voters that the process would be transparent. "We will work on this process publicly. It'll be on C-SPAN. It'll be streaming on the Internet," he said. This comes as Republicans seized on a Dec. 30 letter from the head of C-SPAN on Tuesday calling on congressional leaders to open the final talks to the public and cited Obama's campaign trail pledge to do just that. But Democrats have reacted defensively to criticism that they are taking the most crucial stage of the debate behind closed doors, contending they've conducted a transparent process with hundreds of public meetings and legislation posted online. Asked about that promise, Pelosi retorted, without elaboration, "There are a number of things he was for on the campaign trail." Yon was questioned by the TSA at Sea-Tacoma International Airport. They asked him questions that have nothing to do with security and he didn't answer. Good for him. So they arrested him. Well, they say they didn't arrest him, They just handcuffed him and detained him. What's the difference? The Darwin Award is for a person who removes his genes from the future gene pool by stupidly killing himself. It should only apply to those of the child-bearing age. I don't know if they use that criterion. The winner for 2009 was a rare Double Darwin, says Wendy Northcutt of the Darwin Awards, and is awarded for a crime gone awry in Belgium. On Sept. 26, a pair of would-be thieves hatched a plan to withdraw cash from an ATM machine by using dynamite. "They overestimated the quantity of dynamite needed for the explosion," the citation notes dryly. "The blast demolished the building the bank was housed in." Rescue workers rushed one bomb burglar to the hospital, where he died on arrival. They assumed the second got away until finding his body in the rubble hours later. No one else was in the building at the time of the blast. We came to Cabo San Lucas Saturday. Our second trip. It's a beautiful place. But complex, being in Mexico. So you either spend a lot of money or figure things out on your own. My recent study of Spanish is helping already us with resort staff and out on our own. Eating in a restaurant for the locals we got breakfast with table service for $10 including tip. 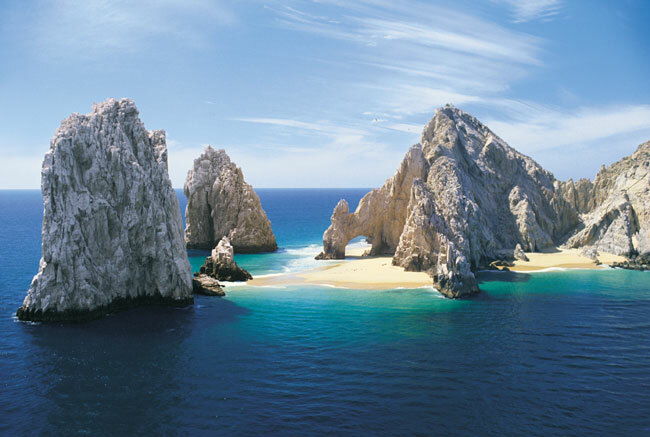 Top photo is the arch at the end of Baja California, which is less than a mile from our resort. Bottom is Playa Grande, our resort, at sunrise on the beach which is on the Pacific Ocean. Update: The water of the Pacific Ocean is not safe for swimming. The Sea of Cortez is safe. But from Playa Grande, even though the harbor is within a few blocks, the nearest swimming beach is a 4-mile drive or $5 boat ride across the harbor. Make an online visit to this stunning photographic portrait of early-20th Century Russia. The photographs of Russian chemist and photographer, Sergei Mikhailovich Prokudin-Gorskii, show Russia on the eve of World War I and the coming of the revolution. From 1909-1912 and again in 1915, Prokudin-Gorskii travelled across the Russian Empire, documenting life, landscapes and the work of Russain people. His images were to be a photographic survey of the time. He travelled in a special train car transformed into a dark room to process his special process of creating color images, a technology that was in its infancy in the early 1900’s. 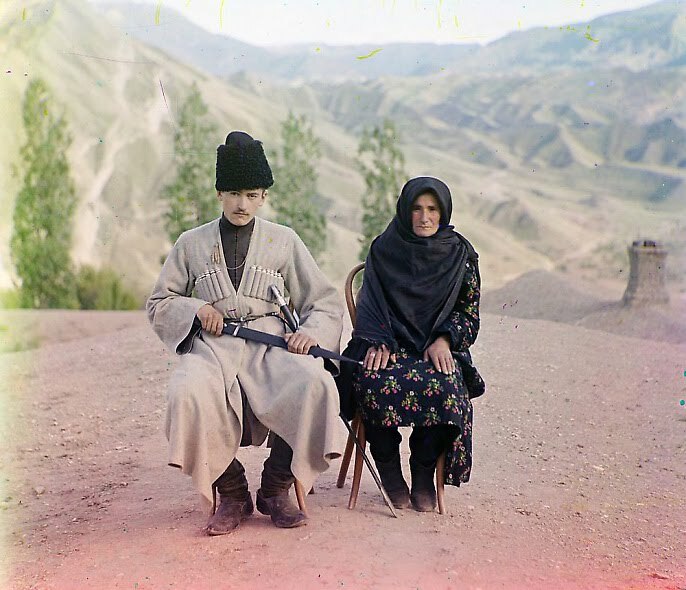 The photo is labeled "Dagestani types, Man and woman posed outdoors; between 1905 and 1915 Sergei Mikhailovich Prokudin-Gorskii Collection." Click to enlarge. The next day she was backtracking saying "My comments were taken out of context." No. Of course she moved the playing field. Monday she said that Sunday she was talking about the response after the attack - not preventing it.